We sell SECOND HAND BIKES. 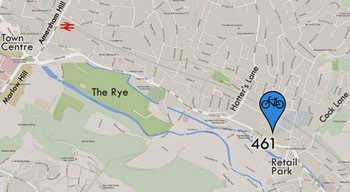 hybrid bikes, road bikes, vintage to modern and children's bikes for all ages. We can also cater for your needs when it comes to CUSTOM BUILT BIKES. and can REPAIR almost anything! Basically, we like bikes to fit into our lives, not bikes that you need to fit your life around. For us, riding is a way of life but it can also mean commuting, socializing, exercise, play, getting things done and sometimes just being seen. Come in to see our current stock. Copyright London Road Cycles 2015. Graphics by Decreate. Awesome Inc. theme. Powered by Blogger.